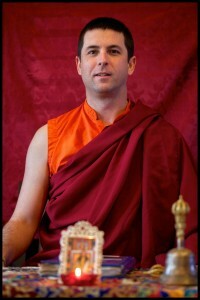 Dzogchen Shri Singha of Portland is happy to present an evening teaching by the Venerable Acharya Lama Orgyen Zangpo. Our precious teacher, Kunzang Lama, will be teaching on the Buddhist view of creating and maintaining unity in our families, our neighborhoods, our communities and our world. Everyone – curious newcomers and long-term practitioners alike – is welcome and encouraged to attend. Event Directors are Kathy Murphy and Martha Robeck. Please email them at pdx.dzogchen@gmail.com or call (971) 303-9108 for more details. Sign up here for weekly email announcements of our events. Venerable Acharya Lama Orgyen Zangpo is a monk and authorized lama in the Dzogchen Buddha Path lineage of Tibetan Buddhism. He has lived at the Dzogchen Retreat Center USA since 2008 and studied closely with H.E. Dzogchen Khenpo Choga Rinpoche for many years. Kunzang Lama is a knowledgeable and accomplished teacher who presents the teachings in an easy-going and understandable style for all levels of practitioners.